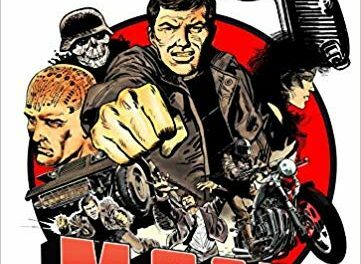 What began as an adaptation/mash up of the The Six Million Dollar Man in one of 2000 ADs first releases quickly became a popular self-standing comic strip of the late 1970’s, and is now compiled and re-published in this collection. Take a man, experiment with computerised acupuncture to give him unwavering energy and the strength of fifty men, install computer circuits into his brain and you end up with Secret Agent John Probe, codename: M.A.C.H. 1. The short, episodic missions that Probe is dispatched on are packed full of danger and excitement. He takes on crazed dictators and paranoid millionaires, thwarts nuclear plots, carries out daring rescues, halts heinous acts of terrorism, faces yetis and alien beings, brings down illegal drug operations and generally defeats the bad guys all over the world and in outer space, whilst packing in codenames, fist fights, overly melodramatic enemies and the odd damsel in distress. 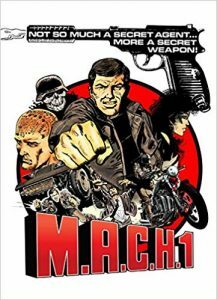 Essentially everything that you would expect from a secret agent story is in here. Whilst he is very much a lone agent, off saving the world each edition and unable to form any human attachments – Probe is a tool and his boss certainly does not hesitate to use him as such – he does carry his computer companion with him always in his head, and their relationship develops with the stories, becoming increasingly witty as M.A.C.H. 1 learns his capabilities and balances his own instincts against the computer’s calculations. You have to love the computer’s often scathing criticism as Probe is in the midst of certain danger: “humour irrelevant 2.01 seconds wasted”, and throughout his journeys the narratives do paint the contrast between Probe’s human emotions and the computer’s rigid logic and narrow focus on completing the mission no matter the potential cost to innocent lives very nicely. Little needs to be said of the writing – it is consistent, solid, well-paced and even reading a collection of stories one after another in this volume it is clear that each one was perfectly thought-out in term of its story arc and action on the page. The artwork too of course is as consistent, and from episode to episode is varied enough to keep the format fresh while carrying Probe’s character and the presentation of his computer’s comments uniformly through one to the next. In the reading some 40 years after their original publication, it has to be said that time has taken its toll on the themes and language – these are very much of their era when we think about social history, what was seen as acceptable that we have since learned from and matured out of, and of course they are very much a product of what was pertinent and relevant in the news in the late 70’s and looking back from that point over recent history. Yet cut forward to today and the underlying messages are still just as relevant. Take the classic science fiction premise – good will triumph over evil, no matter what form it takes. Reading now, we can see the bigger picture, rising above those details and clichés that are outdated, and still appreciate the very heart of what John Probe and his various missions represent and enjoy a well crafted, well displayed action comic.